One-third of Germans feel deceived by Angela Merkel regarding allegations Germany’s intelligence agency BND assisted in NSA spying, but more than half are still willing to back her, rather than her Social Democratic rival. The research, compiled by the Berlin pollster Forsa and released Wednesday, also showed that 52 percent of voters think the spying row is either “important or very important,” while 48 percent of voters not very interested in it, Reuters reports. The poll comes after months of Merkel and her government facing criticism over the allegations that she and her staff green-lighted Germany’s foreign intelligence agency BND to help the US National Security Agency spy on European firms and officials. In recent weeks the spying scandal once again dominated headlines in Germany, when more media reports emerged alleging that, before the 2013 elections in Germany, Merkel's aides had lied to the public about the prospects of a no-spy deal with the United States that never materialized. This sparked criticism from opposition leaders and even some within Merkel’s government, prompting the chancellor to publicly defend her government and the BND’s co-operation with the NSA. “Although this may not be so popular right now, that includes the fact that our intelligence services have to cooperate internationally, and will continue to cooperate, to protect life and limb of 80 million Germans,” Merkel told reporters Monday. Nevertheless, the Forsa poll shows that more than half of German voters would still back Merkel in a direct vote against her SPD rival, Sigmar Gabriel, though that number slipped by 1 percentage point to 56 percent. In fact, Forsa chief Manfred Guellner believes the recent allegations won’t affect Merkel’s standing. 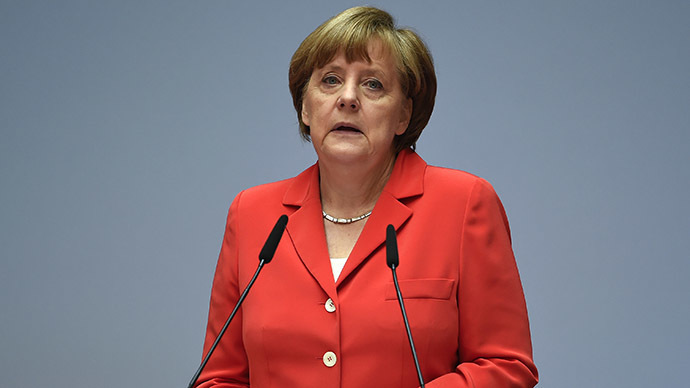 “The BND affair is bouncing off Merkel’s armor of popularity,” Guellner told Bloomberg earlier. As an ongoing process, Merkel’s cabinet members have been testifying before the parliamentary investigation committee, facing the accusations that the BND acted against national interests. In April, based on the leaks by whistleblower Edward Snowden, Der Spiegel reported that BND received thousands of so-called “selectors” from the NSA to spy on targets, among which were European politicians and companies such as European Aeronautic Defence and Space Company (EADS), Eurocopter, and the European aviation consortium Airbus. Furthermore, one-fifth of all metadata gathered by the BND each month, or some 1.3 billion pieces, go to the NSA according to the most recent report by Die Zeit Online. This information includes phone calls, text messages, contact details and times of activity. It has been alleged that the BND has been helping the NSA for over a decade. But it wasn't until 2013, amid the Edward Snowden revelations, that an investigation into the spying activities took place.